This is the website for the parish of St Anne, Nuneaton, Warwickshire, of which St Joseph's Church, New Arley is a part. The lower case orange text below provides a link to other web sites. This list can provide only a tiny selection of the many Catholic websites that exist, especially for national and international Catholic organisations. This is parish is not responsible for the content of these sites. Raise funds for the parish by shopping through easyfundraising.org.uk. Register with the site, then go on to shop with 1,000s of online retailers. They make a donation of up to 4% of what you spend at no cost to you! - as long as you visit the retailers' sites from the links on the easyfundraising page. Easy!!! Our Lady of the Angels, Nuneaton. Our nearest neighbour and the parish out of which we were formed. Our Lady of the Sacred Heart, the parish of Bulkington on the far side of Nuneaton to us. Sacred Heart and St Teresa, the parish of Coleshill, a neighbouring parish. 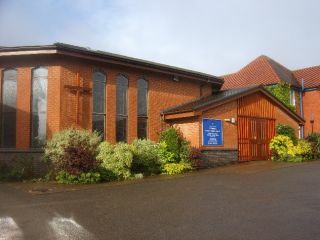 Holy Family parish, Holbrooks in Coventry, which is another of our neighbours. The Pastoral Care Project which seeks to serve the needs of the frail elderly, of sufferers of dementia and of those who care for them. The charity is based at Coleshill and works in north Warwickshire. Nuneaton and District Catholic Fellowship The Nuneaton and District Catholic Fellowship (NDCF) is a National charity, which was originally founded as the Catholic Handicapped Children's Fellowship (CHCF) by Elizabeth Fitzroy in 1956. She recognised that the spiritual welfare of disabled children, particularly those with mental health problems, as well as their families, needs to be nurtured within the Church. Our local NDCF branch organises pilgrimages, trips, social events and many different activitiesfor those with physical, learning and sensory difficulties, and their families, supporting children and adults alike. The Chinthowa Development Trust is a small charity based in North Warwickshire that works in Malawi, Africa. Its primary function is the care of orphans within the villages of Chinthowa, Mpani, Njolo and Majiga located some 50 miles west of the capital of Lilongwe. Its volunteers work for free, are not paid salaries or expenses and every penny donated goes to the benefit of the villages and orphans. The Diocesan Education Service, supporting the teaching of RE and the spiritual lives of our Catholic schools, and asssiting with their managment and governance. The Diocesan Seminary at Oscott, Birmingham. Maryvale Institute, the International Catholic distance learning college based in Birmingham. Opportunities for prayer each day with the Irish Jesuits. To say the Daily Office of the Church have a look at Universalis. Visit here to be able to see the old and new versions compared, or compared together with the Latin original. This is the Liturgy Office of the Catholic Bishops of England and Wales. There is information on that website and also more on the website of the Catholic Bishops of the USA here. If you wish to know more about exploring a call to the priesthood try here for a national site for England and Wales or here for this Archdiocese. But better still, talk to a priest about it of course. If you are wondering about the permanent diaconate. Mount St Bernard Abbey in Leicestershire, a community of Cistercian monks. Downside Abbey in Somerset, a Benedictine community of monks. Stanbrook Abbey, a community of Benedictine nuns in Yorkshire. Aid to the Church in Need, supporting the suffering Church. CAFOD, the Catholic overseas relief agency. Information about the visit of Pope Benedict to this country in September 2010. LIFE charity offering support to pregnant mothers and mothers of young children. Pregnant unexpectedly? Young mum? Go here before you make any decisions. Pax Christi is the national Catholic agency working to promote peace and justice at home and abroad. Lourdes in France where Our Lady appeared to St Bernadette in 1858. To have a look at what's happening now at the shrine, try the web cam. The world's most visited Marian shrine. The Shrine of Our Lady of Knock in County Mayo is Ireland's great place of pilgrimage to Our Lady. She appeared there in 1879. Carfin in the Diocese of Motherwell is Scotland's national shrine to Our Lady. Our Lady of the Taper, in Cardigan is the national shrine of Our Lady in Wales. This has a long history. Our Lady of Fatima in Portugal is the shrine established where three little shepherd children saw apparitions of Our Lady in 1917. Parishioners visited here in 2009. The great shrine of our patron saint, St Anne, mother of Mary who is the mother of Jesus, in Brittany, France. Mostly in French but well worth a look even if French isn't your native tongue. The Basilica of St Anthony of Padua in Italy. Parishioners visited this holy place in 2007. The Holy See's own website.